Kathmandu says:"The ultimate thermal fabric providing superior insulation, moisture management, breathability and sun protection in a comfortable, quick-dry knit fabric." The Kathmandu Altica Thermaplus is a V-necked, close fitting thermal/base layer that I've worn now on several long days' winter walking trips in temperatures down to about -2 degrees C.
I thought the fit was true to size and, once I'd become accustomed to the close fit cut, I found the Altica to be extremely comfortable. The Altica did an excellent job in providing welcome, additional warmth in some really quite cold and snowy conditions. However, as I 'run hot' during higher energy periods, I also need a base layer that provides good breathability and wicking - the Altica certainly provided both. Even better, I've also been able to wear the Altica for several days as the odour retention was almost non-existent. So far the Altica has been very easy to care for - it washes and dries very well. 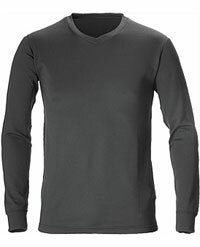 The Kathmandu Altica Thermaplus V-neck top is an excellent option when you need some additional warmth for winter walking.